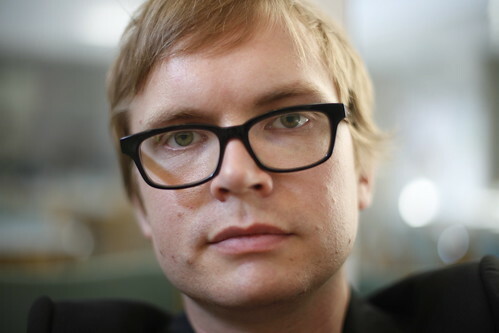 Olli Sulopuisto, 35, is a Helsinki-based journalist who doesn’t like writing about himself in the 3rd person. I make my living as a technology reporter, though I write about cinema (you can call it movies, if you like–I won’t take offense) and pop culture at large. I’ve been freelancing in Finnish since 2007. Nonfiktio is the business name of my one-man company. Squint a bit, ignore the Finnish spelling and I think you’ll able to figure out what it means. But it’s not all I’ve done. I’ve done translations to and from English: several issues of a popular science magazine, various kinds of documents and a few screenplays. There are a couple of pieces that I’ve done in English from the beginning to the end. I’ve also lectured in English at the JAMK University of Applied Sciences, so there’s that. When I was still young, I spent some time abroad, first in Cardiff, Wales, and later in Brooklyn, New York. I wouldn’t go so far as to describe my English as excellent, but I’ll manage. And have I told you about the time our team was selected among the ten finalists of the Uutisraivaaja competition, a sort of Finnish version of the Knight News Challenge? Actually I was involved with two different teams, but that’s just boasting. I spend my free time taking pictures of my cat, wondering about the future of the media, and reading The New Yorker–and too much of what Longform posts online. After all, there are only so many hours in a day. So if you need a solid reporter to cover something and deliver the story in time with the correct wordcount, don’t hesitate to get in touch. Though you probably shouldn’t take a peek at my Twitter stream, because that’s mostly horrible, horrible puns.